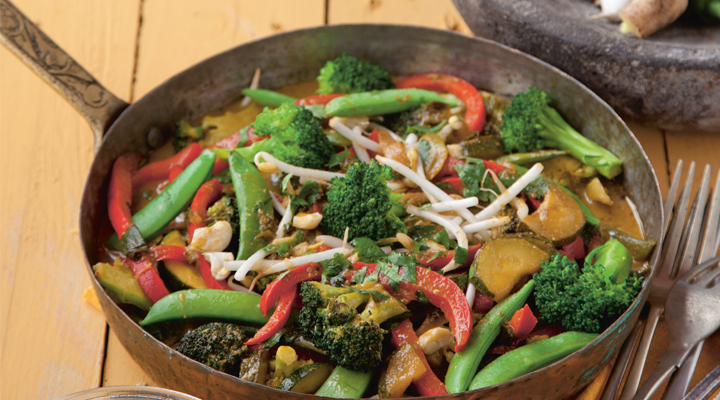 This gluten free green curry doesn't take long to prepare and will be enjoyed by the whole family. Put all the curry paste ingredients in a blender and blitz to a paste. You may need to add a bit of the watery liquid from the tin of coconut milk to make it blend. Heat the oil in a large pan set over a medium heat, then add all the vegetables and fry for 5 minutes. Add the curry paste and cook for 2 minutes, stirring regularly. Add the coconut milk and cook for a further 5 minutes. To plate up, top with the scallions, beansprouts, a few torn coriander and basil leaves and some crushed cashew nuts.